This tutorial is written for the 2.9 version of Ninja Forms where pasting JS code inside Text inputs is possible. 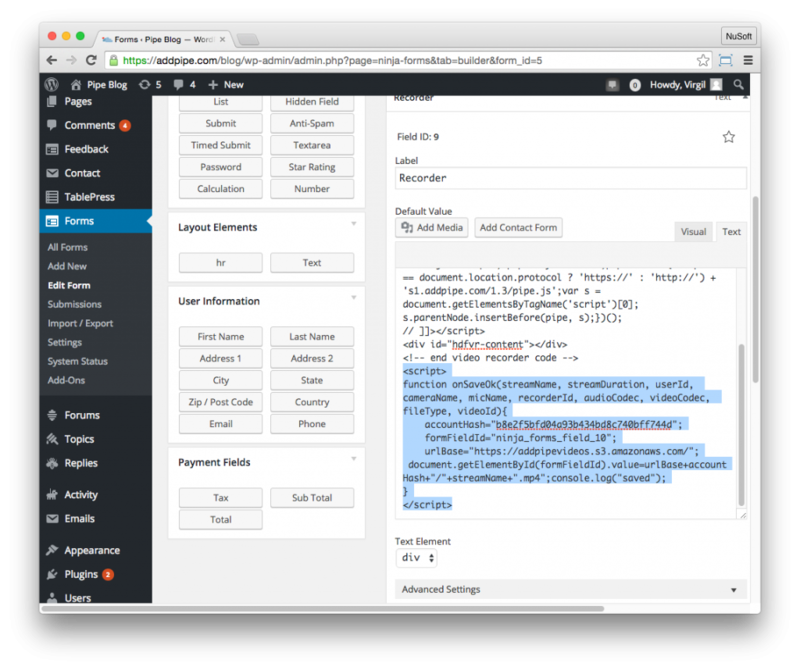 This tutorial will not work with Ninja Forms 3.x which does not support yet including JS in HTML fields. We last tested with NF 3.3.13. 17 November 2016 update: Updated the code to make it work on mobile devices as well. Giving your users the possibility to record videos directly on your website can be a real game changer for your business. 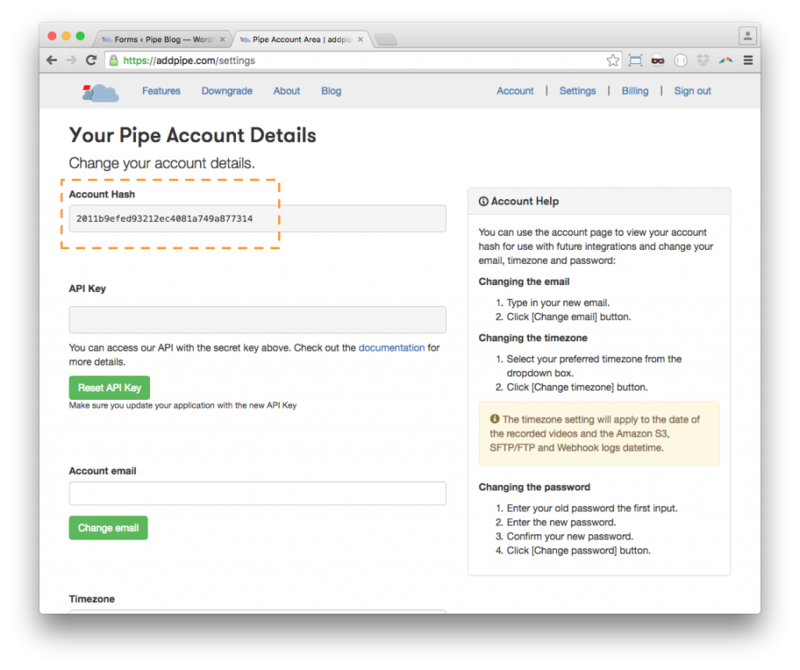 Here at Pipe we’re always looking for ways on how to make this process easier and faster. 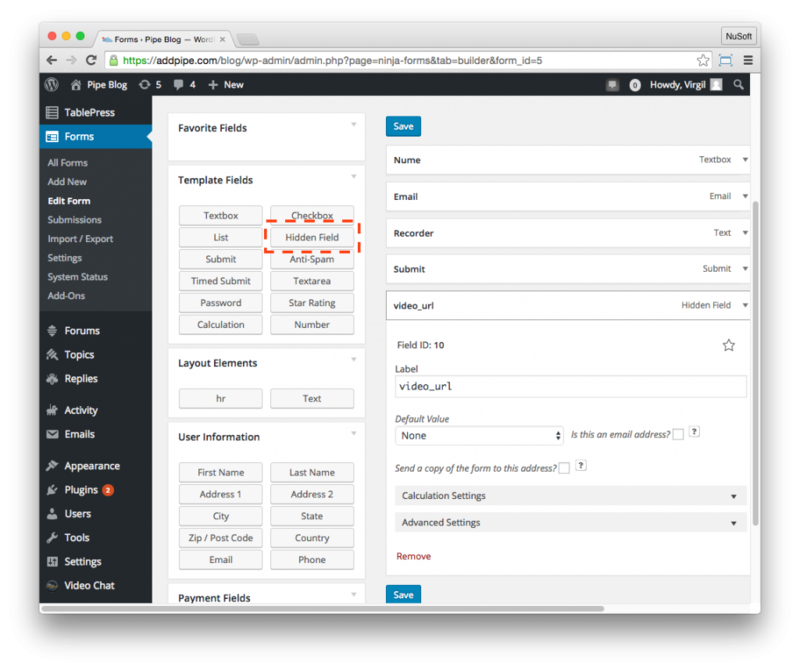 Today we’ll show you how to create a contact form on WordPress using Ninja Forms that also allows the user to record a video message. 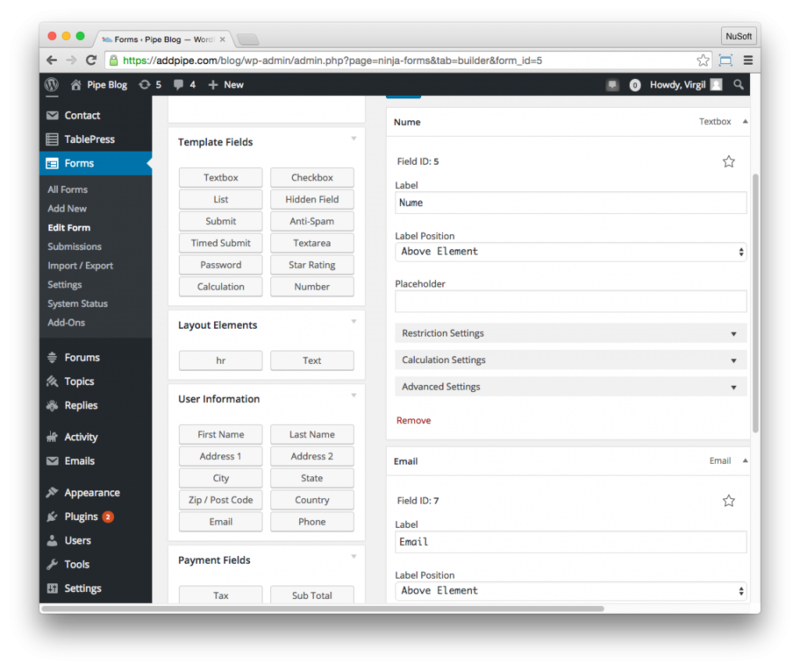 Add an Email field and label it, guess what? Email! 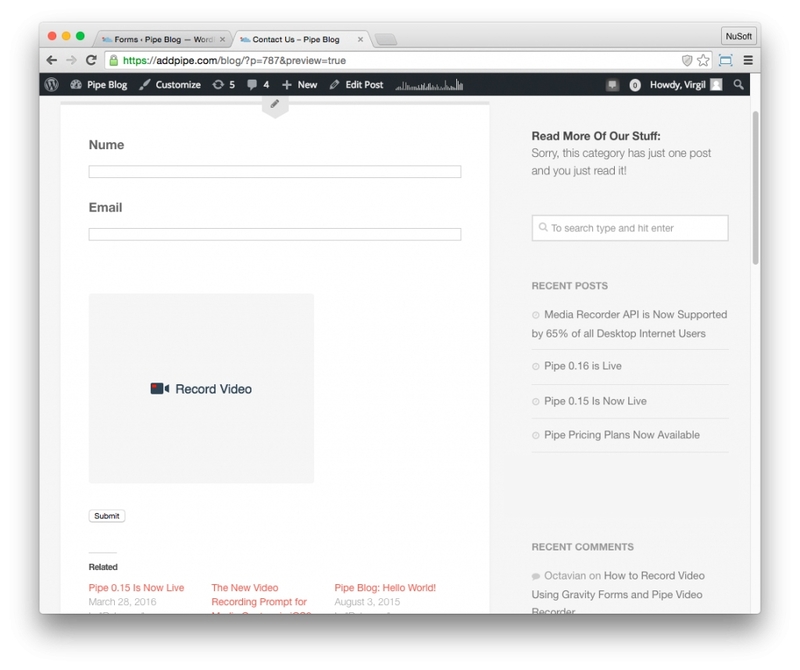 Now it’s time to add the pièce de résistance, the actual video recording form element. 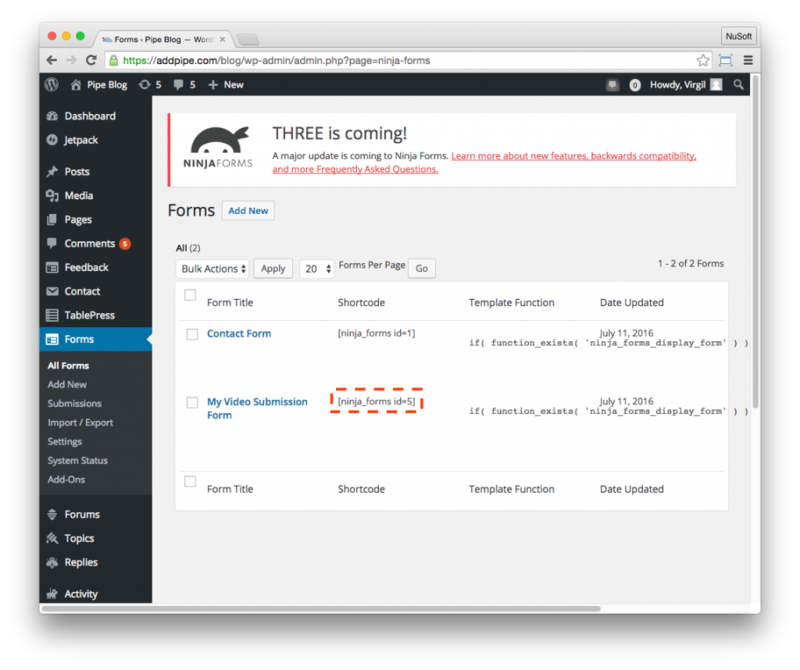 We will get the embed code from addpipe.com and add it to a Text element in Ninja Forms. Visitors will now be able to type in their email, name and record a quick video, using their webcam, to be submitted together with the form. But to link each video with each form submission we’ll have to store the actual video URL. For that we’ll use a 4th input which can be hidden. This field will store the video URL and will be saved together with our form submission thus allowing us to view the video attached to the form submission from the WP admin area. The video recorder now needs to populate the above field with the actual URL to the newly recorded video. For that we’ll be using Pipe’s onSaveOk function (part of Pipe’s Java Script Desktop Events API) which is called by Pipe after a video is recorded and gives us the name of the recorded video and the storage location of the final .mp4 video and .jpg snapshot. Using this info we’ll generate the full URL. device names (camera, microphones) if this info is avb. We’ll only be using the video name in our example but you can include any other video information with the form submission. 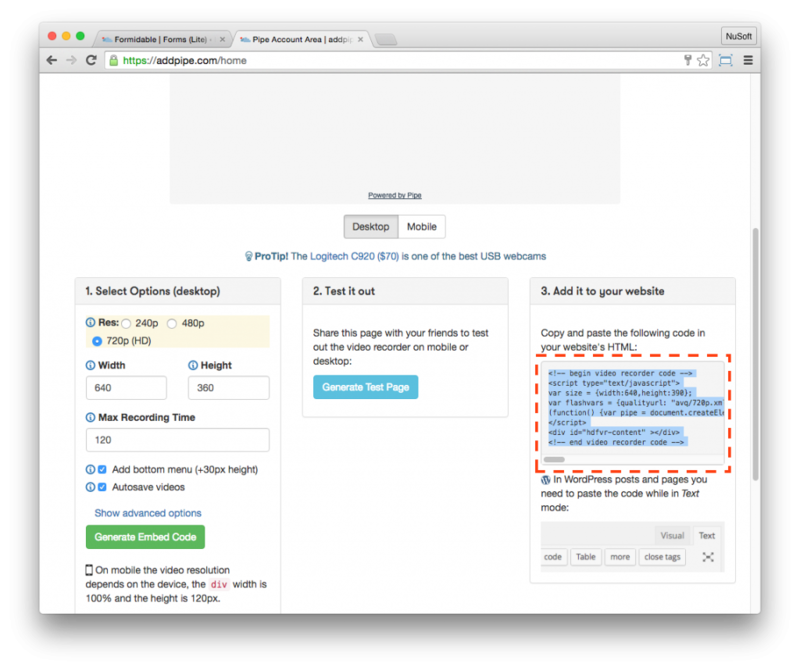 populate the (hidden) video URL field with the actual URL. Your website visitors, when presented with this form will be able to type their name, email and record a video using their webcam. You can see the video_url in the 4th column. This is the direct link to the video and you can copy/paste that address in your browser to view it. 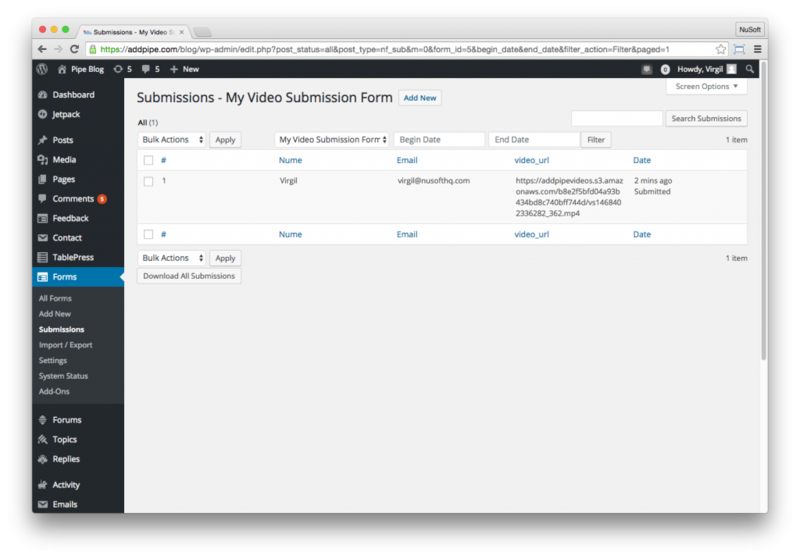 You’re now recording high quality video from your website visitors through a simple form created with Ninja Forms and Pipe Video Recorder. Ninja Forms has a cool feature where you can export your form to a file and import it in another WP website with the Ninja Forms plugin. Click here to download the exported version of the form described in this post. make sure you update the ID value in ninja_forms_field_ID since exporting and importing NF does not keep the original id’s of fields.